When you encounter a problem, you expect to be able to call your IT provider and have the issue resolved. Unresolved IT issues can escalate and turn into large problems, which can lead to interruptions in your company’s operations. Total Computing Solutions understands how important reliable computer services are to you, which is why our service desk is staffed with certified technicians, who are experienced in responding to and resolving problems quickly. We are committed to providing the fast and courteous service that you deserve and expect. Don’t settle for unreliable IT support companies. Total Computing Solutions gives you the service you need when you need it! To learn more about reliable computer services give us a call at (920) 569-2681, or e-mail service@tcsdepere.com to speak with a member of our team today. 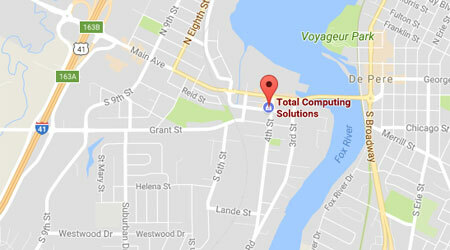 Get the reliable computer service your company needs with Total Computing Solutions. Reach out to us at (920) 569-2681, or service@tcsdepere.com to speak with one of our technical experts to learn more about our computer services and what they can do for you and your company.